If I’m a liberal or progressive Democrat, I’m gleeful to see conservative foes who have preached “the market” at me since the days of FDR now arguing that these millions of workers are an artificial, “unskilled” labor force whose presence merely prevents “the market” from replacing them with machines. . .No matter how principled conservatives may think themselves on this issue, the fact remains that at crunch time they sent the market to the back of the southbound bus. If only it were that simple. Henninger is right about one thing, conservatives who favor some immigration restrictions (as opposed to open, Ya’ll come! borders as is the WSJ’s editorial position) do find themselves conflicted because of the tension he describes. However this tension simply isn’t in play when it comes to opposing this bill no matter how much Henninger wishes for grounds to threaten a payback for conservatives who oppose it. Here’s why. There are more than two bedrock conservative values in play where this legislation is concerned. I’ll list those principles and then grade the legislation–Pass or Fail–on whether it is consistent with those principles. Respect for the Rule of Law: As Henninger admits, rewarding cheats and scofflaws at the expense of those who have played by the rules is at the heart of what conservatism stands for. Confidence in Free Markets: Just what is it about this current legislation that is market-oriented or market-advancing? Henninger doesn’t tell us. Maintaining the status quo in which workers stream across our borders and find jobs, with little or no attempts to enforce the existing laws is much more laizzes fair than this bill. Henninger presents a ledger with only Free Markets on one side and Law & Order on the other. But as I have argued above, there are numerous other conservative principles on the Law & Order side of the ledger, and the very presence of Free Market issues on the other side is suspect at best. Finally, when it comes to actual legislation, conservatives rarely are afforded the luxury of remaining true to every tenet of classic conservatism when in support or opposition. Pure Libertarians may be able to say, “Hey, if it calls for the government to do something, I’m against it.” But conservatives must always wrestle for the right priorities. And we are. Update: NRO’s Mark Levin focuses on the “markets” business, here and here. Peter Fleming (May 31, 1907 â€“ August 9, 1971) would have been 100 today. Oh, to live in an eraÂ in which “adventurer”Â is a legitimate job description! You may be more familiar with the work of his kid brotherâ€”Ian.Â My last issue ofÂ New Criterion had a great essay on this remarkable and neglected writer to mark his 100th birthday. Hmmm, I wonder how many degrees of separation there are between me and ‘ol Peter? Well, Peter attended Eton and Oxford just a few years before theologianÂ Derek Prince did, and they definitely would have known of each other at King’s College and interacted there. Derek Prince’s grandson, Christopher Selby is a good friend and Derek Prince Ministries has been a long-standing client. So there you have it!Â Happy Birthday ol’ chum! As my family and close friends will attest, I am the Mayor of Wannabe-ville and the City Manager of Hacktown, USA.Â I golf, play the guitar and shoot photographs, allÂ withÂ a clumsy amateurishness they seem to find charming (and a little sad). Thus, from time to time I’ll post some of my favorite photos I’ve shot in my travels. Below,Â a view of Table Mountain from outside Cape Town, South Africaâ€”one of the most beautiful and captivating places I’ve ever seen. I let yesterday come and go without noting an important anniversaryâ€”the fall of Constantinople on May 29, 1453. When the city walls were breached by Muslim Turks on that date, the church called Hagia Sophia had stood, looking like this sophia-painting.jpg, on that spot for 1000 years, representing one of the mostÂ astonishing architectural achievements of that, or any age. * btw… It’s already begun. posted in Uncategorized	on May 29, 2007 by	David Holland Comments Off on Et tu Linda? Thus it didn’t come as much of a surprise today to find a syndicated columnist labeling everyone who opposes the current immigration reform boondoggle as racists. What dropped jaws all over the country today was that theÂ accuser wasn’t some lefty nutroots bomb-thrower. It was prominent conservative columnist Linda Chavez. Some people just don’t like Mexicans — or anyone else from south of the border. They think Latinos are freeloaders and welfare cheats who are too lazy to learn English. They think Latinos have too many babies, and that Latino kids will dumb down our schools. They think Latinos are dirty, diseased, indolent and more prone to criminal behavior. They think Latinos are just too different from us ever to become real Americans. . . Stripped bare, this is what the current debate on immigration reform is all about. Fear of “the other”. . .
You should alert the Townhall webmaster immediately that someone who thinks like Michael Moore has hacked your blog. I have not received a reply but, judging by some of the reaction I’ve been reading, she may be a little swamped. In a moment: One of the coolest web sites ever. But first a word of explanation. The picture above was for an ad for the Scripto Satellite. 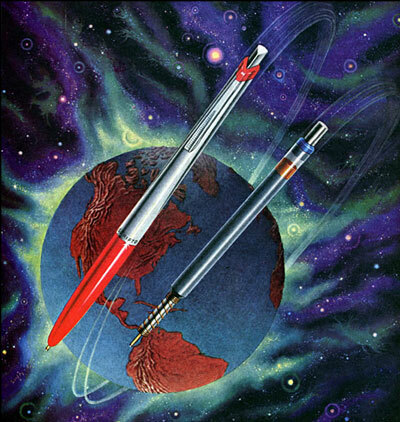 “The first pen designed and engineered for the atomic age!” the ad boasted. That’s another thing I love about the pre-Beatles, pre-Hippie era—the view that “atomic” power was going to make everything either niftier or neato-er, or both. Thus, I about fell out under the power like I’d been hit with Benny Hinn’s Nehru jacket when I found Plan59.com, a web site devoted to late 1950s art, advertising and ephemera. Poking around in that site makes me feel like a kid watching someone reach for a frozen pot pie. You know. . . like this. When a soldier falls, it is obviously a searing event for the spouse, the children, the parents, the community.Â The death ofÂ a combat soldier is a tragedy. But it is a unique tragedyâ€”one deeply infused with meaning, and honor. And yes, glory. Today the mainstream media and the liberal cultural elites in America will make much of the losses our servicemen have suffered in the conflict in Iraq. They will do so with an agenda and with a near complete inability to grasp the code of honor and sacrificeÂ by which men at arms live. And die. Which makes it all the more vital that the families which produced these fallen heroesÂ and suffered their loss, know that we do. Each family has in their possessionÂ a folded American flagâ€”one that graced the casket that carried their loved one home. So, on this day I’ll raise my flag high above my house. There it will flyÂ as a silent token of my profound respect and thanks. Â As mentioned in the previous post,Â cheerleaders forÂ this immigrationÂ “reform” bill tell us we need to bring millionsÂ and millions of people who illegallyÂ slipped into this country “out of the shadows” so they can be better assimilated into American culture, just as the waves of immigrants that came through Ellis Island were in the previous century. A large majority of these illegals want to become flag-waving, tax-paying, English-speaking Americans. And that a significant numberÂ are likely to become such. Â Anyone who asserts the truth of assumption #1 is either dishonest or massively immune to overwhelming evidence to the contrary. The May DayÂ pro-illegal-immigration marches of the last two years have been filled with second and third-generation illegals waving MexicanÂ flags. Read Victor David Hanson’s excellentÂ though appalling Mexifornia: A State of Becoming, or Pat Buchanan’s State of Emergency and you’ll get a feel for just how delusional this assertion is. Â So how aboutÂ assumption #2? How likely is it that the past and future waves of illegals streaming across our borders will even take the most basic and vital step in the assimilation process, that is, learning English? A lot ofÂ public signageÂ now carries both English and Spanish, as does most product packaging.Â Nearly every commercial voicemail treeÂ I encounter beginsÂ by asking me if I prefer English or Spanish. Voting ballots are now offered in Spanish as well. You get the point. The need or incentive for any Spanish-speaking immigrant (even legal ones) to learn English is rapidly approaching zero. And immigrants that don’t learn English will notÂ assimilate. Period. Who is really being assimilated here? One of the arguments constistently put forth by the advocates of large scale, unselective immigration (illegal and otherwise) is that immigrants from Mexico and Central America will eventually assimilate into American cultureâ€”just as previous generations ofÂ Germans, Irish, Czechs, Chinese, Vietnamese and others have done so willingly and completely. Poke aÂ pro-immigration “reform” politician with a sharp stick these days and instead of saying “ouch,” they blurt out a storyÂ about their tired, poor immigrant grandparents who were part of a huddled mass yearning to breathe free. Invariably,Â Lady Liberty, Ellis Island, the American Dream and, occasionally, YentlÂ are invoked.Â The next sound you hear is an assertionÂ that all today’s smuggled-in, undocumented, law-flouting, Western-Union-money-sending-back-home-to-Mexico, no-income-tax-paying, social-services-straining,Â huddled masses want is the same thing. and be proud of being an American. Sure, we all know people whoseÂ ancestors probably came over with the Vikings whoÂ ignore about half of these rules. But it doesn’t change the fact that any new arrival that follows them will haveÂ put him or herself on a fast track to following the example of all those immigrants of yesteryear that are now being invoked with such vigor. A stream of illegal immigrants from “countries of interest” (nations marked as seedbeds of terrorism) are crossing our Southern border. How do they get here? This interactive presentation graphic has the answers regarding this underground railroad for terrorists. (From an excellent investigative series by Todd Bensman of the San Antonio Express News. This goes to the heart of what is so maddening about this current immigration bill. It treats legalizing the 12 million+ illegals already in the country as if it is the truly urgent problem, while offering questionable and token and watered-down and begrudging efforts at securing our borders.